At 8:00 we did a special Gongyo with Mr. Hall. Not only was it the regular first of the month gongyo, but more significantly it was the 10th anniversary of enshrining the Joju Gohonzon. Besides having a fantastic day at school where my drawing teacher said I was doing B+-A- work and doing a half hour and more shakubuku; a special meeting hancho up was called with Vice President Williams at the First Headquarters. What an incredibly good ‘homey’ feeling, like I would not have traded being anywhere else for anything. What great fortune of being with V.P. Williams on his 10th anniversary with the Joju Gohonzon. He told us someday, in fact 10 years from now, we would have this Gohonzon enshrined in a room 10 times as big and it would be the International Center. He gave us great hope for the future. He talked about the San Diego Convention and revealed some of his hopes for it. Our theme song is going to be Jingle Bells. He said Santa Claus is really a Bodhisattva and we are his helpers, his Sancho Panzas. He told us to get plenty of rest, because Kosenrufu will not be done tomorrow or the next day but will take many years so let’s please all make it to the year 2000 together okay?! Hai! The highlight of my Day as seeing Sogohonbucho enshrine the Joju Gohonzon at our new Headquarters. It was beyond words. After Gongyo when he turned around his life, his eyes are just so beautiful, I felt tears in my life. I feel so happy when I’m around him. He encourages you so much through his life. He said that our Gohonzon is the first in America, November 3, 1963, enshrined by the High Priest Nittatsu Shonin and with Pres. 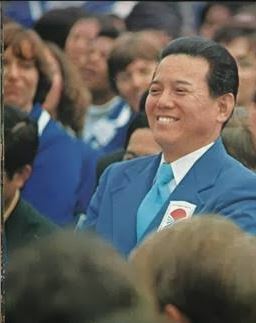 Ikeda. He talked about Hosshaku Kempon, and how we are going through the same human revolution from Transient to True Teaching. I can’t parrot what he said, but I can really feel it, but can’t write it. Today was the opening ceremony, but I am much happier to have seen Sogohonbucho the first to enshrine Joju Gohonzon and actually the beginning of Honmon with Gohonzon. It was a great beginning. Tonight we promoted World Tribune. No success, but we planted a lot of seeds. Hosshaku kempon: “Literally, “to cast off the transient and reveal the true.” A Buddha’s act of discarding his transient or provisional status and revealing his true identity.” Pg. 166-167 NSIC. Today I got up at about 8:00 and cleaned my room. Sal came over and we chanted an hour of good daimoku and did Gongyo. Afterwards we drove down to Fullerton and got a girl’s World Tribune. It was really a good experience Shakubukuing an older lady and a young girl. They were Sal’s old acquaintances and it was a good Shakubuku. They fed us lunch and we had a good personable talk, no real hang-ups. It feels real good. Then we went to the Honbu and fortunately the Fuji shobo was open and I got my Seattle T-shirt for Band Tommorrow….I had an unbelievably full schedule for me, but the Gohonzon helped me achieve my goal; for your daily schedule has got to be a goal. I got one World Tribune today which brings my total to four. It broke my record of last month, so I’m happy for that. And it just seemed my schedule answered itself. I was going to pick up my new butsudon, but Russ left it here, I was supposed to call up Jay Stone, but Jay called me; I zipped in cleaning the house and it was just a good day. Evening we had a good Zadankai meeting. We had an elderly man and many younger guests. I helped the older man and it made me feel good inside. But not just good, but it put me through human revolution. One other thing I must note; My Dad, while buying some hay, ran across a man he hadn’t seen in ten years. The benefit is this man offered my Dad or asked him to interview for a job managing a Rental (U-Rent type of set-up) Shop for $15,000-20,000 + commission a year. It sounds good, but I don’t get my hopes too high. I just have got to get him to chant so it goes through; I will chant, too of course. Oh, I practiced my instrument again day by day. Now I must extend that to my studies. World Tribune campaigns. On a monthly basis we would go out and promote the organization’s newspaper to members, friends, relatives and meet briefly each night to see who got the most subscriptions. Zadankai meetings: Discussion meetings were held in individual’s homes and occassionally at the Headquarters, wherein one would bring guests to a meeting designed to introduce them to Buddhism. Honbu-Each headquarters had a meeting place. Santa Monica Headquarters originally was housed in an old Elk’s Lodge that we remodeled as members. One would enter through a front door into the reception area where the Men’s Division or Young Men’s Division would be on Toban (guard). Downstairs was a sitting area with vending machines, near the Fuji shobo where one could purchase religious articles such as beads, incense, books, and convention t-shirts; the Headquarter’s chief’s office, and restrooms. One would go upstairs, take off one’s shoes, and then enter the main meeting area which housed the especially inscribed Joju Gohonzon (Object of worship) made for each headquarters, housed in a large Butsudon on a platform in the front of the room. One would chant sancho daimoku three times out of respect. Usually on the right hand side of the wall hung a photo of President Ikeda, the third President of the Soka Gakkai. On the platform were offerings of fruit and during New Year’s mushimoshi, rice cakes. On another altar table were place two candlesticks, an incense burner and on the floor to the right a bell which would be rung to help others in a call to prayer. Women would sit on the right, men on the left. In an adjacent room was a room especially dedicated to President Ikeda whenever he would visit. Next to that was a kitchen.